The 18th century saw an increase in ornithological writings and the beginnings of the development of ornithology as a science. It was the century of Carl Linnaeus [1707-1778], the Swedish botanist whose primary work lay in plant systematics. 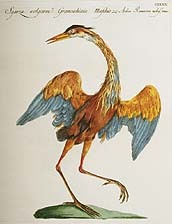 Linnaeus's introduction of a binomial nomenclature to all forms of natural history influenced the thinking and classification schemes of contemporary and future ornithologists. The works of Linnaeus are voluminously represented in Cornell Library's collections.